Here we go! Are you ready? Do you have your fabrics all gathered up? If you’re still waiting for something you ordered, never fear, this quilt is really easy, so you can catch up really fast. I just thought I’d give you these instructions before the weekend, in case that works out well for you to get this step done. We’re gonna start off by cutting all the background pieces for the quilt. I’m going to suggest you label the pieces, so if you didn’t download the free label sheet yet, you can do that HERE, and print them out and be ready (or feel free to make your own). I printed 3 copies of my label sheet, so I’d have enough for all my colors, etc. Follow the instructions for the version of the quilt you’ve chosen to make: the traditional or the modern. For the traditional version, I used yardage, so all the pieces are cut from the same fabric. We will first cut strips from the width of the fabric (WOF), so all your strips will have selvages on both ends, and be 40-42″ in length. We will be cutting the strips 2 1/2″ wide. Cut the pieces in the order stated, cutting the largest rectangles first, down to the smallest squares. From your background fabric, cut 47 strips 2 1/2″ x WOF. Then cut the selvages off the ends. I put my pieces in a little bin that I kept on my cutting table while I was working on the quilt, but sometimes I use ziplock baggies to keep things organized. Use whatever your favorite method is to keep from getting confused (especially if you have to walk away from it for any length of time). I used fat quarters for my modern version background, and I made sure to cut some of each size piece from each print, so that I would have a good variety sprinkled all over my quilt top. 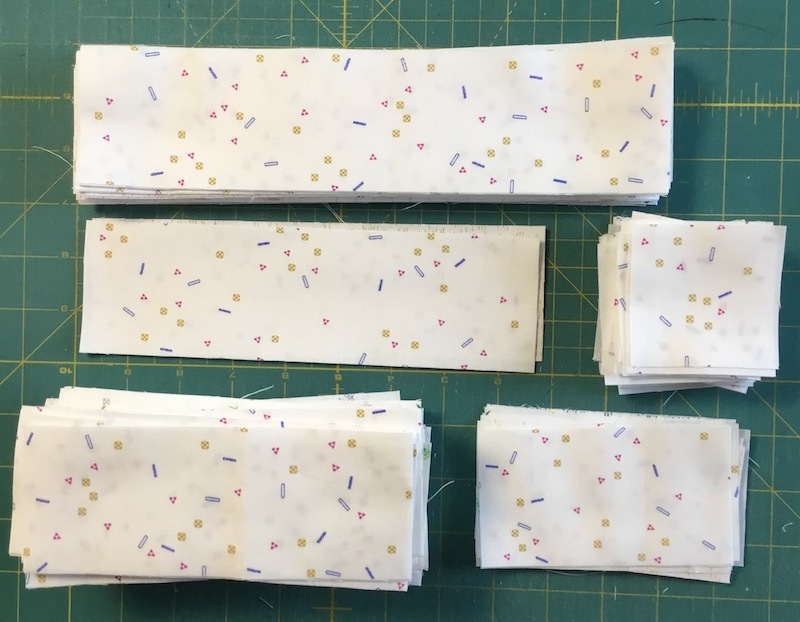 I cut each fat quarter into 2 1/2″ strips the long length of the fat quarter, so that I had strips measuring 2 1/2″ x ~22″ to begin with. Then I removed the selvage end, and cut my rectangles and squares from those strips. And that’s it for today! This gives you the weekend to get a good start on this, and I’ll be back on Tuesday with the instructions for cutting the print pieces! It’s time for Ornament #2! If you’re just getting started, I recommend that you go back and read all the posts from the beginning, so you can have access to all the extra links and info. I won’t be repeating all that information in every post. The links are in the sidebar at right, so you can navigate easily. First off, today, I’m going to talk about spacing. For the first ornament, it wasn’t a huge deal, because it was the first one. But now you have that first ornament in place, and you need to carefully position all your next ornaments with each other so that they look even and not crowded. 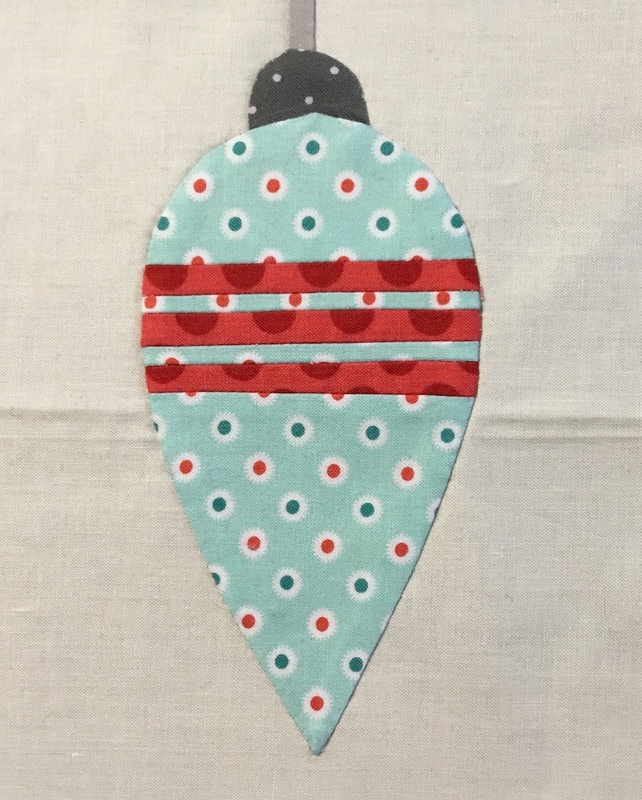 For the stitchery version of my quilt, I started at the left edge of my background fabric, and I’m adding all my ornaments to the right as we go along. 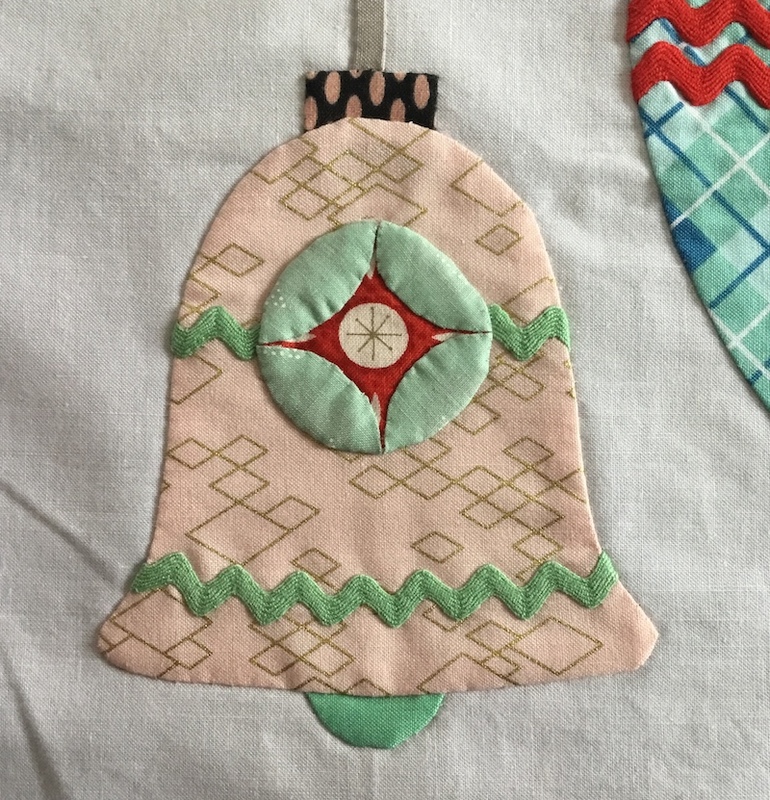 Since my background piece is width-of-fabric, I don’t want to run out of room to keep adding ornaments toward the end, and I don’t want them to look crowded or uneven as I go, so I’m using my hanging strings as a placement guide. 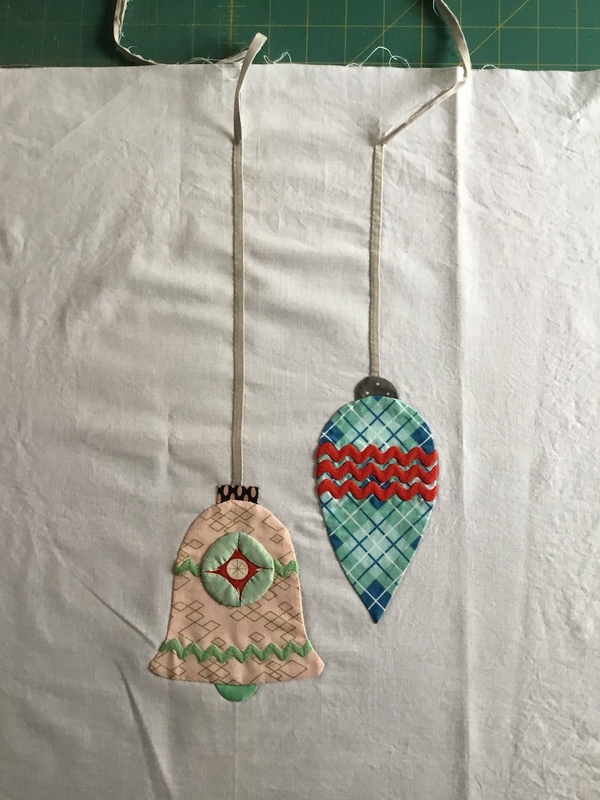 I’m going to place all my hanging strings 3″ apart, and then place my ornaments accordingly, so that they don’t bump into each other. Note, also, that I’m not embroidering the hanging strings until the end, and I explain why in the pattern. I hope this helps you when you decide how to position your own ornaments. You don’t have to do them like mine; I’m just offering up mine as a suggestion. Now for the ornament . . .
Again, in the pattern, I’m showing you what stitches and colors I used where, but it’s only a guideline. I used rickrack on this one, too, trying to tie the look of them all together a bit. I really like the rickrack — it helps with that vintage feel! For this one I again made bias tape strips for the accent stripes. I also fussy cut my fabric for those little medallion parts. So again, you have lots of options with these, and I encourage you to have fun and make them your own! The pattern is available as a PDF instant download in Hazel’s Mercantile for the bargain price of $1.75. It has all the instructions for all the versions of the ornament shown above, along with full-size templates, and all the information I could think of to include. It’s ready for download, so you can get started right away! Again, if you have any questions, don’t hesitate to contact me and ask. I’ll be happy to answer! Welcome to the Virginia’s Puzzle Quilt-Along! Today I’m discussing the fabric requirements for the quilt, showing you the sample quilts, giving you the schedule for the quilt-along, and some labels to download. So here we go . . .
First, you wanna see the quilts, right? 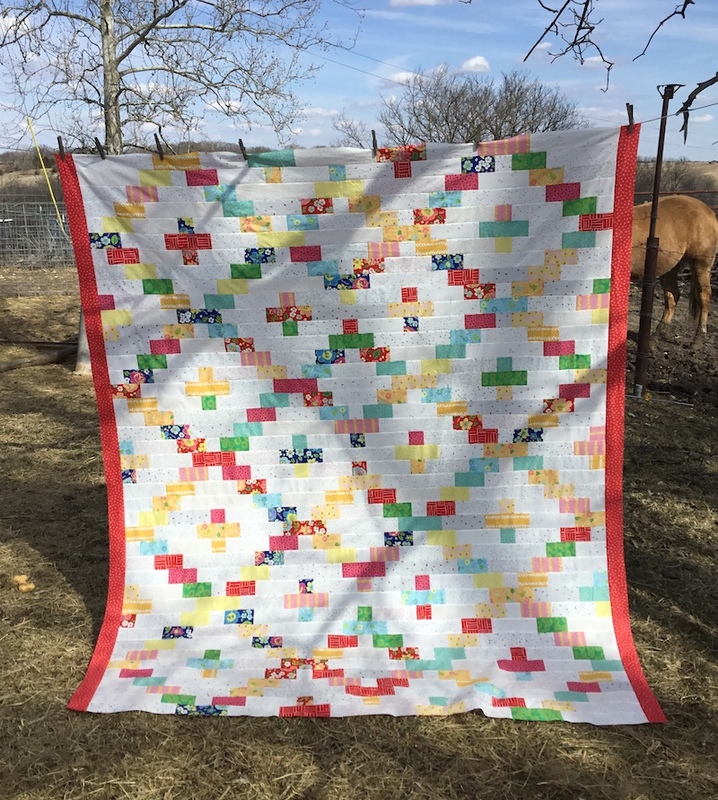 Keep in mind that My Cowboy is still crippled, and I have no help taking quilt photos right now, so you can see how that goes around here, but at least it’ll give you a chuckle when you see the pictures! I’ve done two versions of the quilt — one in traditional colors, and one in a more modern color way — partly because I can never decide which I like better, so I did them both! But this just gives you more ideas, so you can benefit from my inability to make a decision. In keeping with the World War II theme, and the time period of the quilt I’m recreating from the photograph I showed earlier, I researched a little bit on what colors were popular right then. Here’s the best examples I found: Most Popular Colors . . . — scroll down to the 1940s to see where I started drawing inspiration for my quilts. Maybe this will give you a jumping-off point for making your own fabric selections. For my modern version, I realized that my friend, Victoria, recently launched a new fabric line that has these colors, plus more! 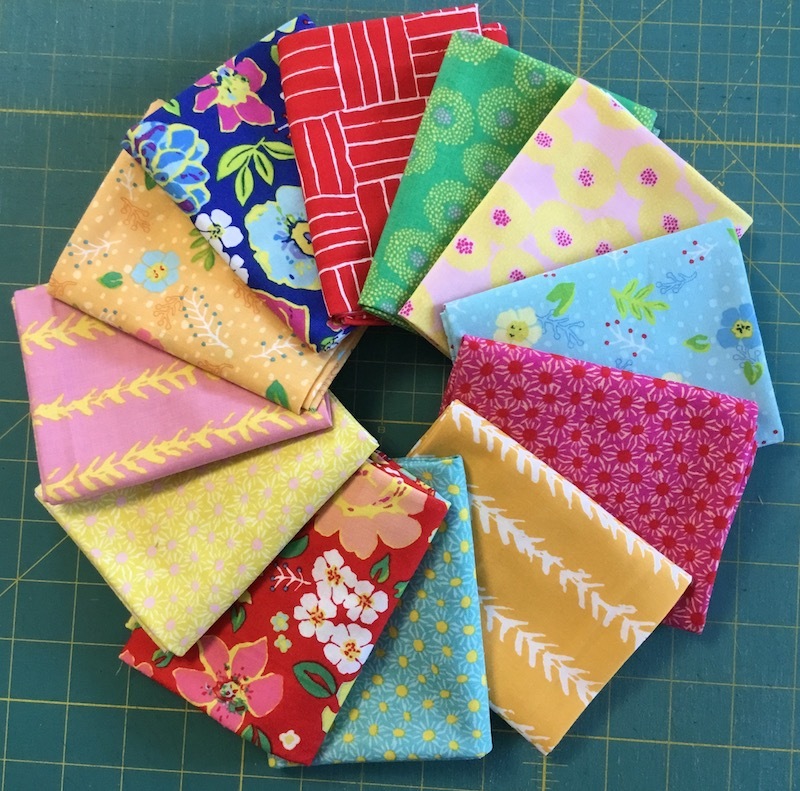 So I chose a selection of fat quarters from her new Playmaker fabric collection in the colors that were popular in the 1940s, and added in some bright green and pink from that same collection. To modern it all up, I used her entire collection of Neutrals for my background. This quilt also has side borders (which are totally optional), and the finished size is 70″ x 82″. 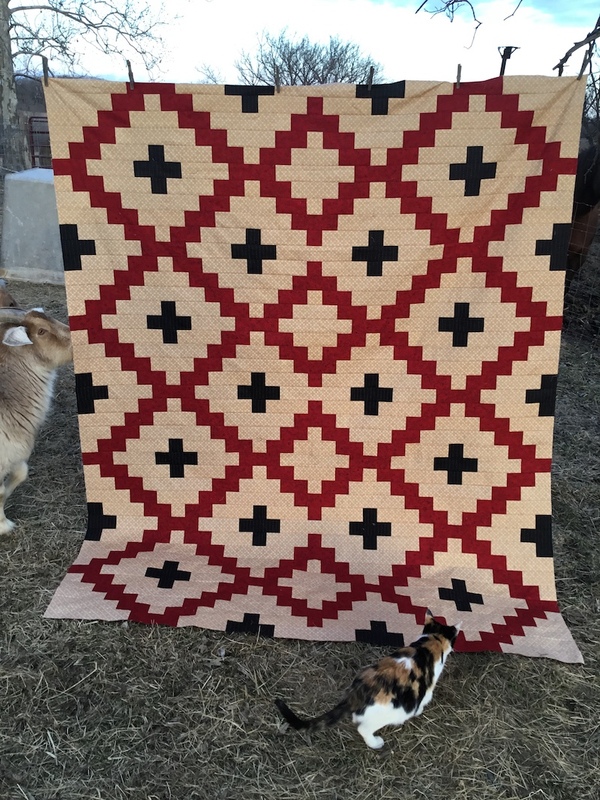 For my traditional version, I wanted a 3-color quilt using yardage, and I knew I wanted to use red. Once I chose my tan background, I thought a patriotic theme would be good, since the theme is World War II, so I went on the hunt for a navy blue to use with my red and tan. However, my red print has black in it, and navy just wasn’t working, so I went with red, tan, and black. But I do encourage you to consider the patriotic theme for yours, and then the quilt could serve as a Quilt of Valor, or a veteran’s quilt, when you’re finished. You could also switch the positions of the red and black, making the larger areas in black (or navy) and doing the individual crosses in red. Or choose your favorite three-color combination and go with that! I left the side borders off this version, and it finishes at 66″ x 82″. You can, however, add the borders if you like. Just some other ideas for you to think about . . .
Here’s the fabric requirements, by version . . .
You can totally use a jelly roll for the prints in this version, with some background yardage, as long as you make sure that all of your jelly roll strips have good contrast with your background fabric and don’t blend in too much. 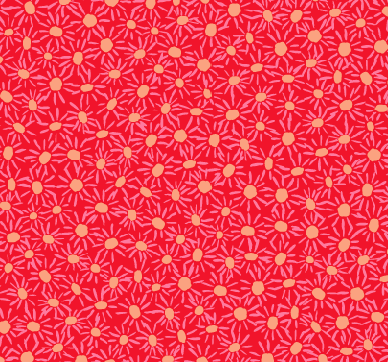 I started with 12 fat quarters of prints, but if you add more, you’ll get a better variety for an even scrappier feel. Or feel free to go completely scrappy, and use up all the odds and ends in your stash! Here are the prints I used. I chose 12 of my favorites that fit my World War II-inspired color choices. 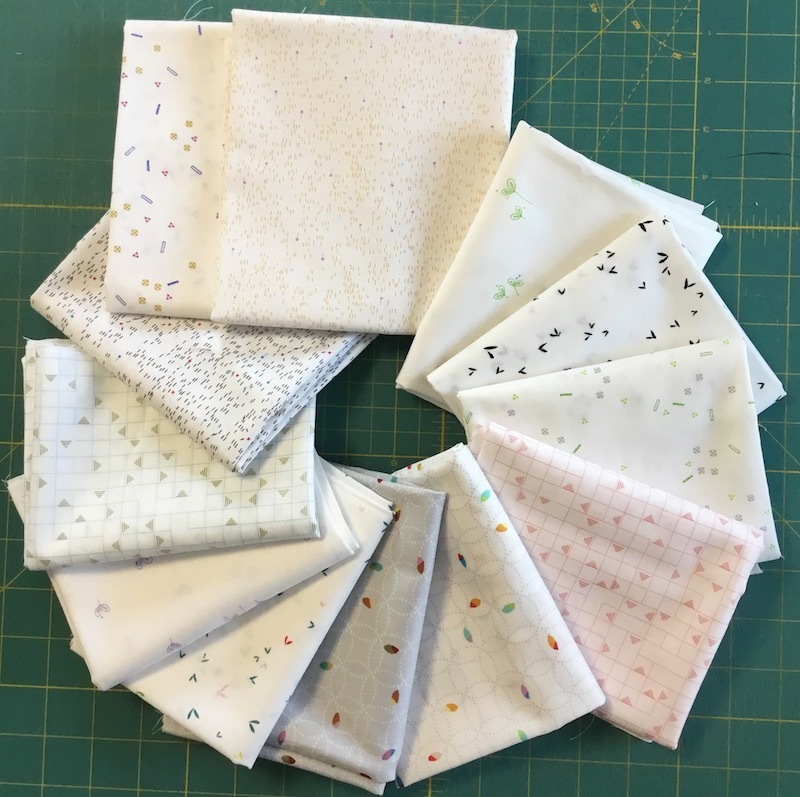 You can buy these exact fabrics HERE, plus choose more for even better variety within your quilt, if you wish. 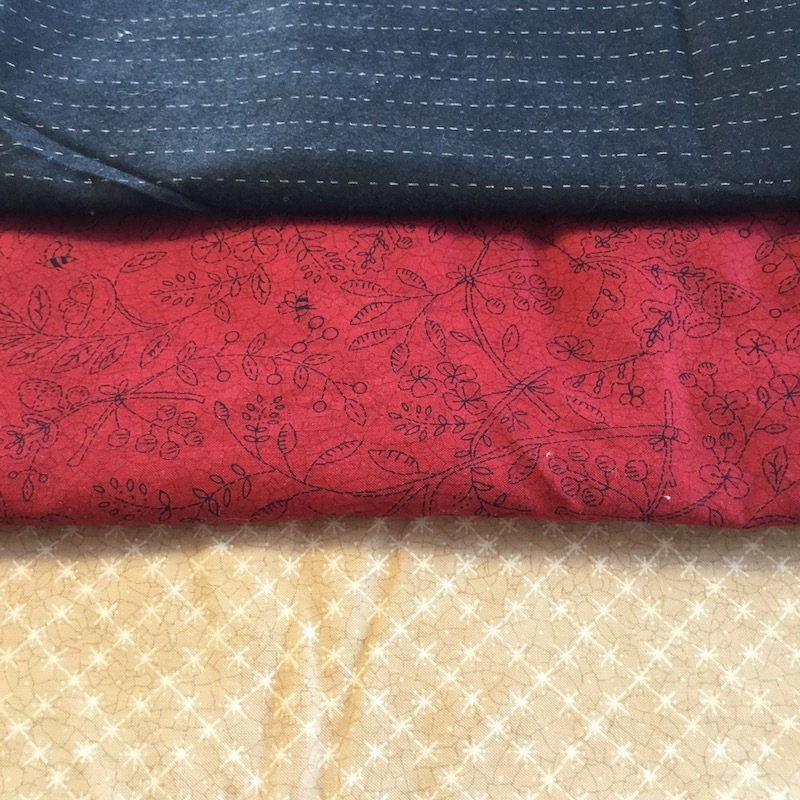 Here are the fabrics I used in my sample quilt. They’re older Moda prints, and they might all be by Kathy Schmitz (I know the red is for sure). For backing (for either quilt), you will need 4 1/2 yards of regular-width fabric, or 2 1/4 yards of wide-width backing. As usual, I’ve made labels for you to use throughout the Quilt-Along to help you keep things straight. This quilt is made in rows, and it’s imperative that you label the rows very carefully as you go. You can download the labels here: VirginiasPuzzleLabels. Here’s the proposed Quilt-Along schedule. The sewing is easy on this quilt, so we can afford to move it along fairly quickly. You should be able to have a finished quilt by Memorial Day! Links to all the steps will appear in the sidebar at right, once we get going, and I will also try to remember to make each link live here in this post as well, so you can easily find each step. Along the way, I’ll have some give-aways and other goodies, along with the regular Life of Hazel Ilene posts, AND the stuff that’s going on in conjunction with the Vintage Christmas Ornaments Quilt-Along that’s running right now, so be sure and check in often so you don’t miss anything! PS: If you follow me on Instagram, and want a good chuckle, you can see some of the outtakes from the disastrous photo shoot! There’s a new free Quilt-Along starting, and it’s time to introduce you to it today! A while back, reader Karen F. suggested that one of my quilt-alongs should have a World War II time period theme, and I readily agreed, because I’ve been wanting to recreate a design that appears in a photo of my great-uncle Roland Hyde. He’s pictured here with his girlfriend at the time, Virginia. See the lovely design in the background? It doesn’t look very large, and for all I know, it’s actually a rug, and not a quilt, but that’s what we’re gonna be making — a variation of this design, as a quilt! 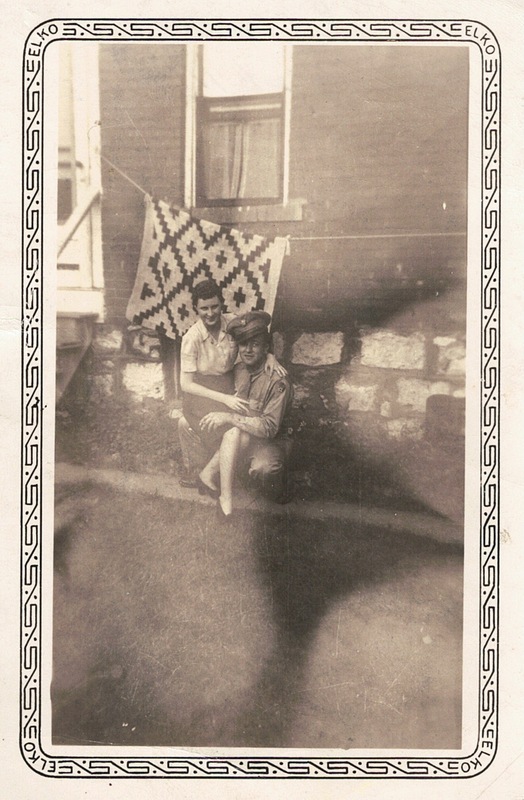 While I’m reasonably certain this photo was taken outside of a house in Kansas City, I don’t know whose house it is, and I have no idea who the rug/quilt belonged to. The date is September 14, 1943, right smack dab in the middle of World War II. Hazel was born in 1936, well before the war began, and her brother, Donald, was born in 1939, on August 9th. Less than one month later, Germany declared war on Poland, beginning the biggest and deadliest war in history, involving more than 30 countries and lasting six years. But with the deadly attack on Pearl Harbor, December 7, 1941, the United States could no longer remain neutral. Hazel’s father, Vern, and her uncle, Roland, both served in the Navy during World War II. Here are some links where you can read about the Hyde family’s life during the war, at least as much as my sister and I could piece together. I’m not going into much detail about the history of World War II, because you can read that just about anywhere, and you will recognize lots of names, words, and phrases related to this horrific event, such as Holocaust, Hitler, Guadalcanal, atomic bomb, Anne Frank, Auschwitz, Blitzkrieg, Battle of the Bulge, D-Day, etc. I have watched lots of documentaries and read a lot about it, and it’s never any less horrible. Especially heartwrenching are the stories from concentration camp survivors and combat veterans. I believe my grandparents did a good job of protecting their children from the knowledge that there was a great war going on, and kept them busy and entertained so that they did not have to worry. I’m sure this was not the case for every child during that time. I simply cannot imagine what some people endured during those six years, and even afterward. As for the Quilt-Along, I’ve named the quilt “Virginia’s Puzzle”, after the Virginia in the photo with Uncle Roland, both for the way it looks, and since it’s sort of a puzzle as to who Virginia really is, since that is not who Uncle Roland ended up marrying! 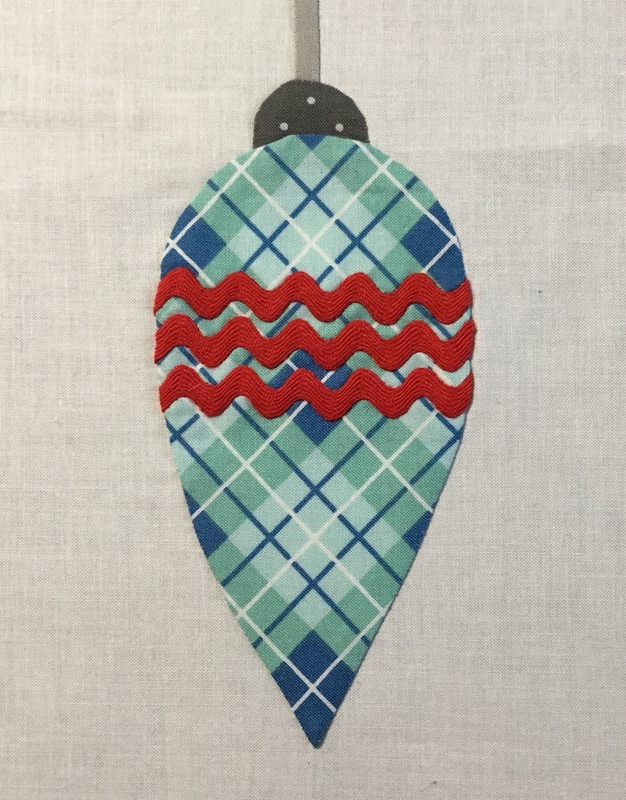 Throughout the quilt-along, I will tell you a bit more about Uncle Roland, and I’ll be back on Monday with the fabric requirements and a schedule for the Quilt-Along, so we can get going. Before I show you the ornament and its options, I first want to provide you with some links that might be helpful. 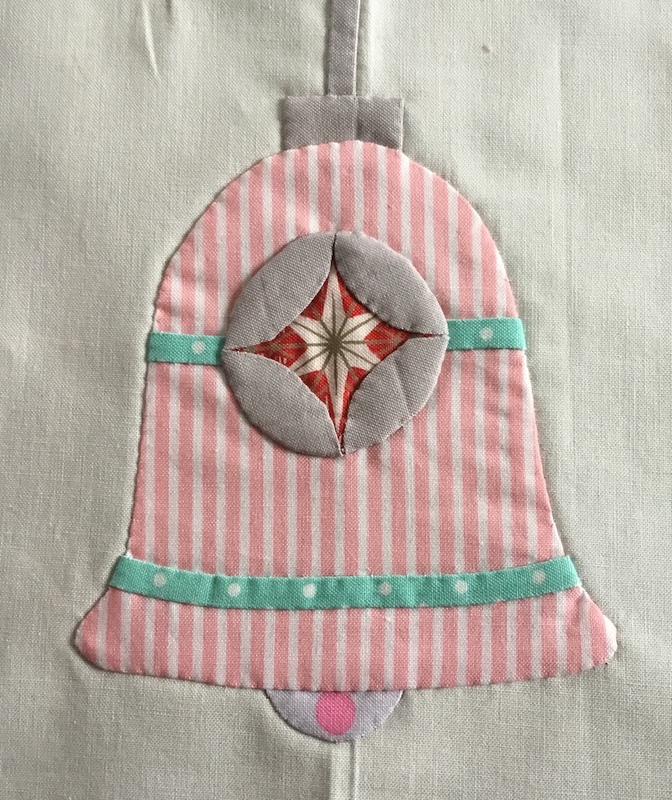 There is also some information on the fusible method of appliqué included in the first post mentioned, if you need help with that. So . . . here we go . . . Vintage Christmas Ornament #1! 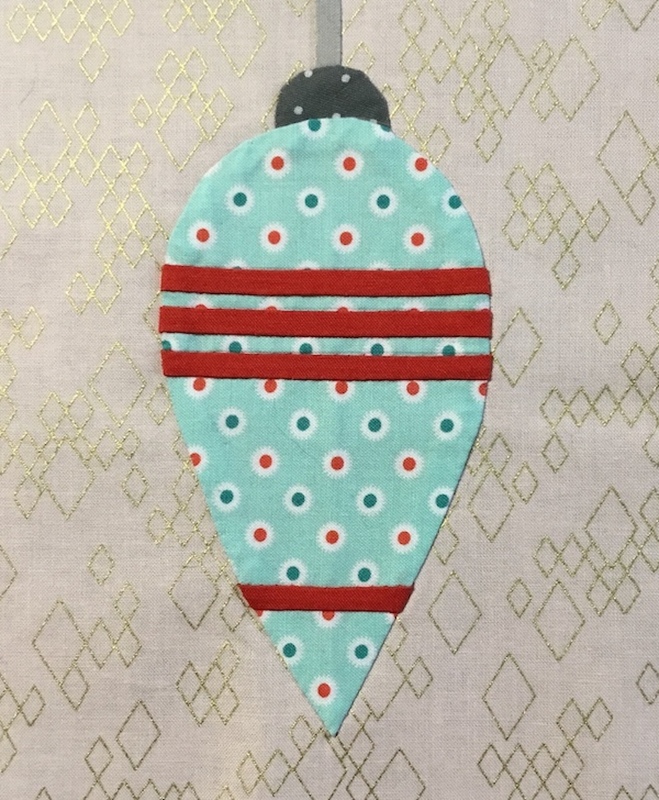 I’ve shown you how I did mine, but you can use whatever colors and stitches you like to decorate your ornament and make it all your own. Or you can use rickrack as an embellishment, instead of using fabric to make your stripes. Pretty ribbon would work here as well . . . even more options! So there you have it. Lots of options! Options, options, everywhere! The pattern is available as a PDF instant download in Hazel’s Mercantile for the bargain price of $1.75. It has all the instructions for all the versions of the ornament shown above, along with full-size templates, and all the information I could think of to include. So go download it and print off your templates and get started! And as always, if you have any questions, don’t hesitate to contact me and ask. I’ll be happy to provide clarification, or make corrections (which I hope aren’t necessary), and answer any questions you have. Whenever I hit “publish”, I always feel like I’m forgetting something important, so if you notice anything missing, be sure and let me know! 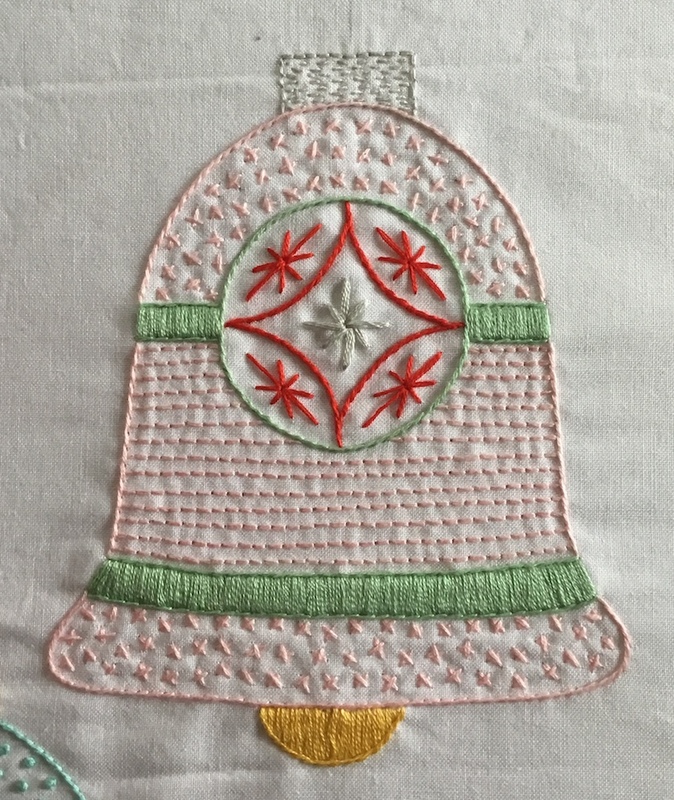 If you’re planning to do the stitchery version of the Vintage Christmas Ornaments Quilt-Along, then this post might be of interest to you. I’m gonna show you how I prep my background fabric for doing the hand embroidery. 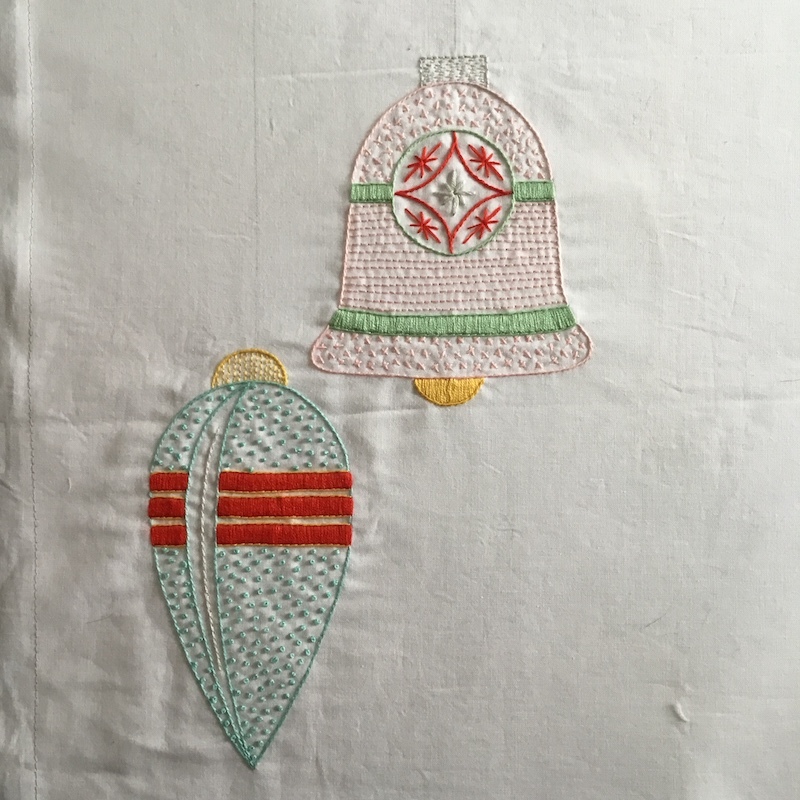 The finished size of the embroidered version will be 36″ x 16″. I’m not completely sure where my brain was when I decided it would be 48″! Sorry about that. Mathing is hard! If you’re using normal quilting-weight cotton fabric (or any other lightweight fabric) for your embroidery background, which is what I’m using, then it’s best to add some sort of stabilizer to it to keep the embroidery from puckering or “taking up” too much and looking wrinkled when you’re done. 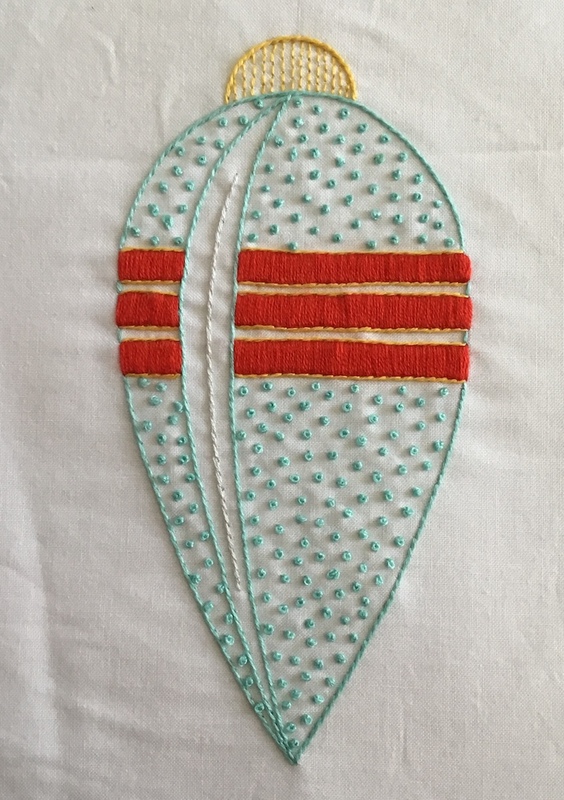 For mine, I use Pellon ShapeFlex (SF101), which is an iron-on woven stabilizer that goes on the back side of your background fabric, and then you stitch through both layers. 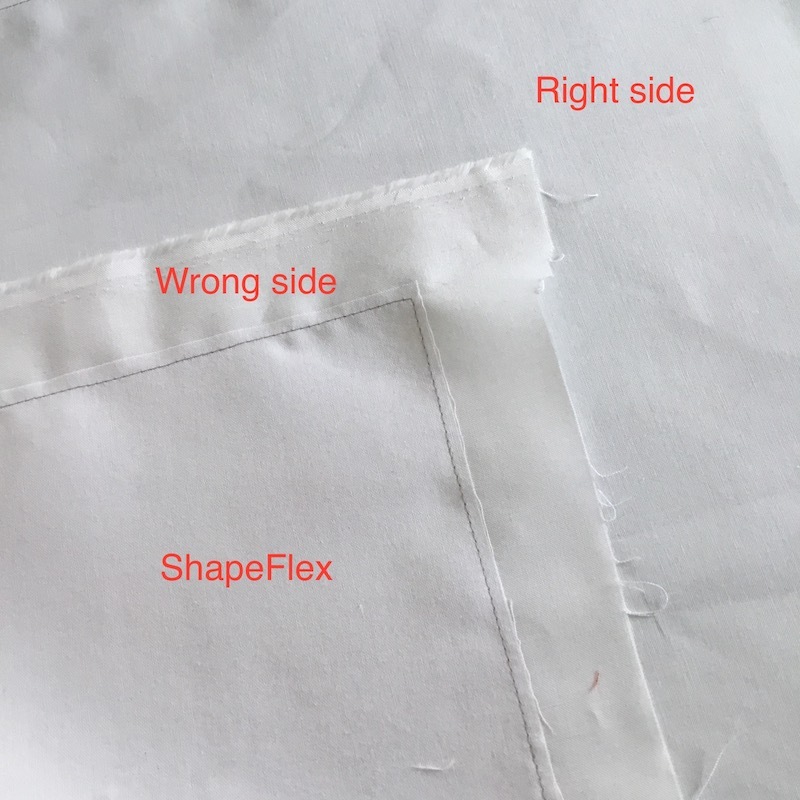 The stability of the ShapeFlex keeps your stitching nice and flat. My background fabric is Moda Bella White solid. I started with a 5/8-yard piece (as stated in the yardage requirements for the stitchery version). The pieces should be approximately 22.5″ wide. Pellon ShapeFlex is 20″ wide, so all I had to do was cut my length of ShapeFlex to match my background piece, approximately 42″. I pressed my background fabric, wrong side up on my ironing board, then placed the fusible side of the ShapeFlex piece against the wrong side of my background fabric, so they matched up with the ShapeFlex piece being just a bit smaller than my background. Then I pressed it on. The instructions for this come with the ShapeFlex when you buy it, if you need any clarification on exactly how to press it on. Make sure you get it smooth without any crinkles or wrinkles. It will be a permanent part of your project! Once I had my ShapeFlex ironed onto the back side of my background, I then stitched around the edge of the ShapeFlex to hold it to the background fabric at the edges, so that while I’m wallering it around to do all the stitching, it won’t come loose around the edges. Once you have this done, you’re ready to mark your designs onto the background and do the stitching. The first pattern comes out on Tuesday, so you’ll be all set, right? Please note: There are other embroidery stabilizers on the market, and as my grandma always said, “There’s more than one way to skin a cat,” so this is just my way of doing it. If you have another method or another product that you prefer using, then by all means, please do your own thing. The information I’m providing is simply in case you’ve never done this before and need the information. You can certainly take it with a grain of salt!